I have a million thanks to give to the LYS Search feature on Ravelry. I'm lucky to have the map light up like a little christmas tree in Los Angeles, but around Bridgnorth, it's a slightly rarer sight. 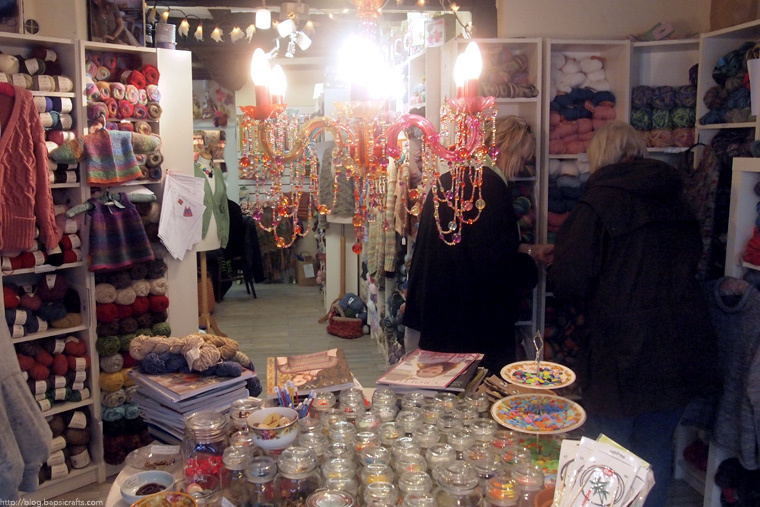 So when I found out about Ippikin, I had to sink the £20 travel fare to visit! Unfortunately it had to rain on the day we set out, but I was determined to travel anyway (and Jason was such a great sport about it too!) The moment we spotted the shop I snapped just one photo and ran inside for shelter. 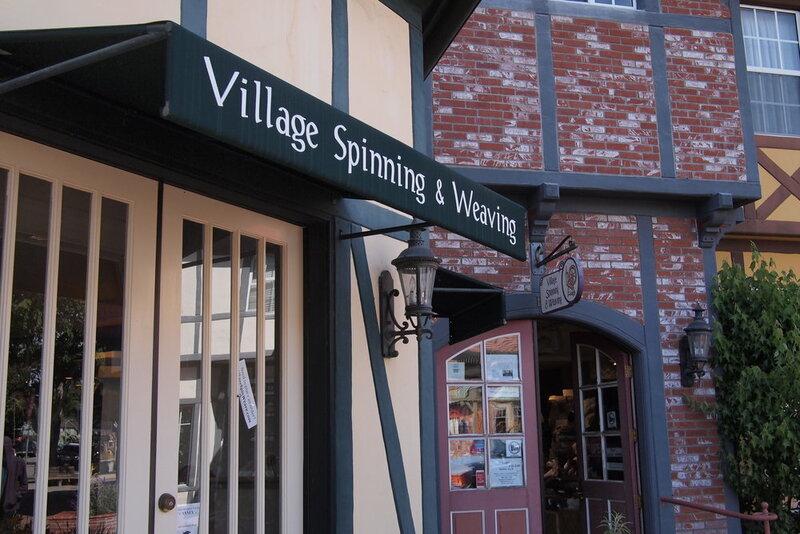 You'll have to see for yourself if you get there--the place is a little yarn haven! Among local brands carried are Rowan, Lion Brand, Opal, and much more. I had a great time squishing skeins that I've only seen photos of online. 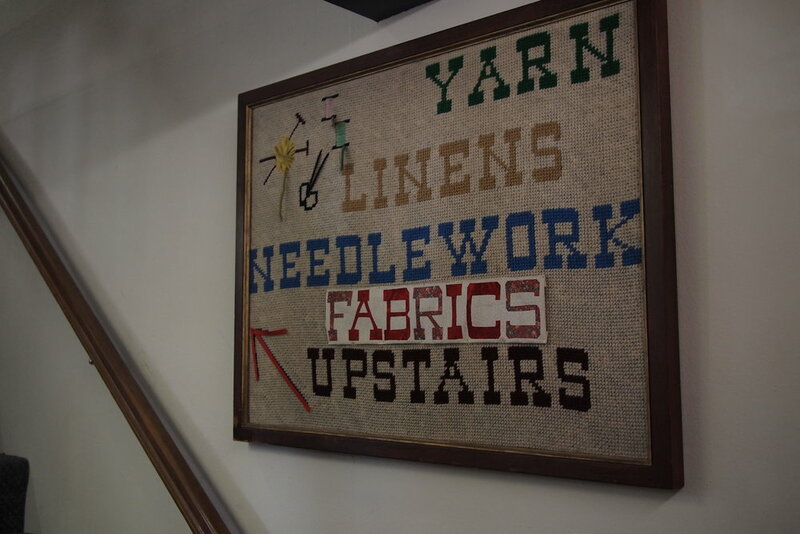 There's also a nice little nook to knit and chat. On the day I visited, a small crochet class was currently in session. And, of course, I made a rather large personal purchase. I don't allow myself the luxury very often at all, since I'm kind of in practice of not having a personal stash when I can help it. But these yarns! I've seen sock after sock knit in Regia or Opal yarns and, crap, here's my chance! The Rhubarb colorway, and this variegated bluish shade of the Opal yarn are going to look fantastic as socks. I'm not going to cast any of those on just yet, since they'd most likely be in progress for a while. I anticipate not being allowed to knit at all on the airplane back, so sparing myself of a sock wip in the suitcase will be the best idea. As for the DK Knitcol yarns, well..
My first published pattern maybe? The Irish Wellington Socks by Aileen Cahill. 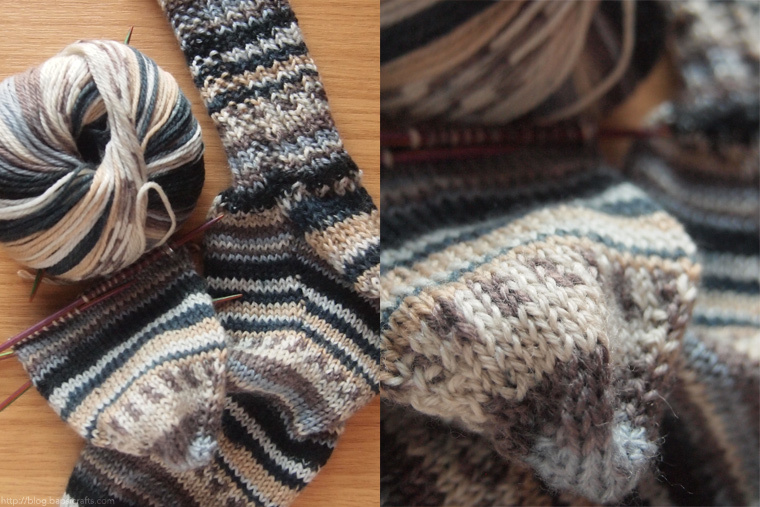 I felt the straight up stockinette pattern would complement the self-striping yarn really well. I'm working with Drops Big Fabel in Forest, a fitting colorway with which to remember all of my forest walks while here in England. :D Jason's going to have a pair as well, in his chosen shade of..wait for it..plain black! The simplicity of this pattern will work really well for that too. I just might gnaw an arm off if I had to work anything like cables with a jet-black yarn. The smaller skeins(?) are elastic thread I plan to use for the cuffs of Jason's pair of socks. Wool is pretty springy, but I think he'll enjoy socks that do a better job of staying up. We'll see how that goes.. 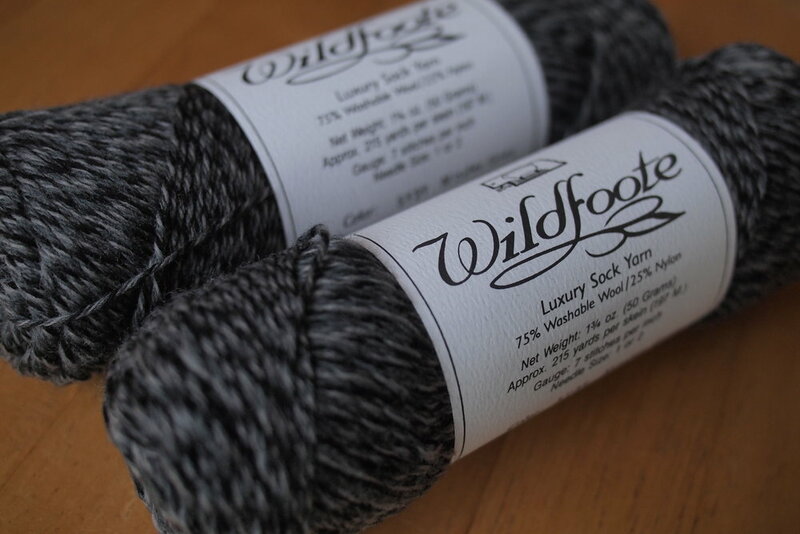 Both yarns are 75%wool and 25% nylon. Thanks for your suggestions! I'm very optimistic about the durable quality of these yarns, and am doubly glad to know that it comes in a worsted weight as well! These socks are gonna fly right off my needles, without a doubt. 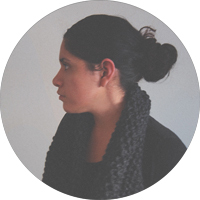 This post is part of Eskimimi Makes' 5th Annual Knitting & Crochet Blog Week. To find posts by other participating bloggers, simply google 5KCBWDAY7 and explore away! I took so long to blog about this mini sock project because I was just too damn busy wearing them around the house. Now they're all pilly and extra wooly and a little felted, just how they should be. There's gonna be a whole lot of sock knitting going on this season. I've got 2013 resolutions to achieve! I made a very modest order from Knitpicks about a week ago and it arrived today. Two skeins of Comfy Sport in Whisker for a gift pair of socks, and a darning egg for when the day finally comes to mend a pair of my own or the boyfriend's. Going to cast on today, will update soon! The semester finally ended! I still have momentum from the rush of finals [and frankly, there's a feel that there is still much left to do], but I did count some change from my knitting jar and went to get these gorgeous skeins of Patons Sock Yarn. 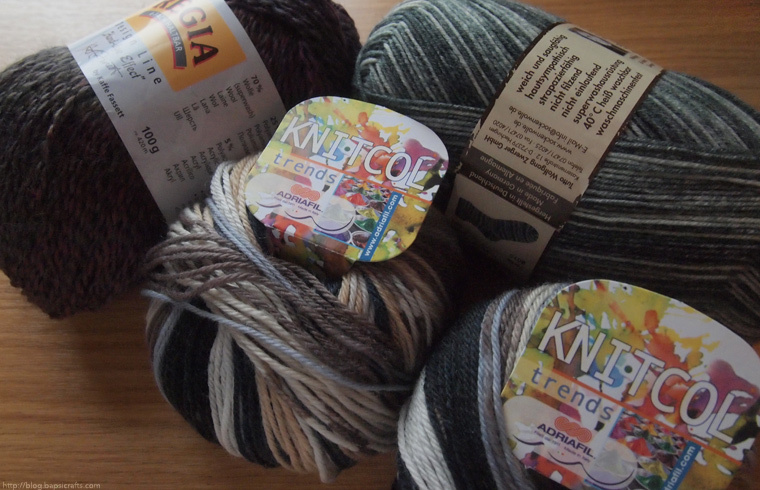 The pair on the left is in the colorway called Grey Brown Marl and on the right's Pumpkin Spice Jacquard. Words fail me when I try to describe why I love these color schemes. Looking at these skeins really excite me. I'm sock/sock yarn addicted! I casted on TDTU Vanilla Socks again with the Marl colorway, since I really want to see those color shine with a simple pattern. As for the color on the right, some Globe Trotter Socks might work well with them, but I'm not really sure. Many of these lovely patterns that I see on ravelry involve motifs that move from the cuff toward the toe. I feel horizontal blocks of color might break what is trying to be achieved with that look of a pattern. Tempted to just work with another simple stockinette pattern with them, but something a little less mindless might be for the better. Don't hesitate to throw some suggestions my way! P.S. I will be participating in this, starting tomorrow! Do let me know if you're joining in as well so I can keep up with your beautiful posts. behold, the amazing shrinking yarn stash! with the exception of stuff for my shop [those skeins are used up and sent away within the week], i haven't made any personal yarn purchases in a long while. it's all been stashbusting and i'm proud to see the basket overflowing a lot less with each passing week! have you been stashbusting too? have you had any little victories lately, or has your yarn basket grown? do tell! i had a little bit of that finished knit syndrome, a feeling that i haven't got anything to do now that i'm done with my most recent project. sure, there are four wips on the shelf waiting for attention but i just didn't feel like touching those. i wanted the excitement of a brand new project! so here we are with a little grey thing on my little circulars, a simple little experimental wip based on one of my design sketches. as a sort of beginner knitter and someone very new to publishing any knitting designs of my own, i feel like i run the big risk of reinventing the wheel or stepping on someone's toes in coming out with anything less than a super intricate pattern involving never-ever seen before patterns and inventions and the like, which to put it lightly has discouraged me from publishing anything in the first place. to throw in a different topic out of the blue, i've noticed in my two months of being a knitter that my stash has been growing quite a bit, even if i'm knitting pretty steadily and finishing at least a thing or two a week. so i'm trying a little experiment to limit my yarn/notions spending, by only allowing a purchase after finishing ten projects, instead of just letting myself fall prey to those wonderful little knitpicks sales emails or a gorgeous colorway someone's blogged today. so far i've got three out of ten projects down, with the 4th on the way! i'm optimistic here about this little plan here, and feel that if i don't make it to ten before ordering more skeins, i'll at least be a bit more aware of what i do and don't really need to have right now in my stash. 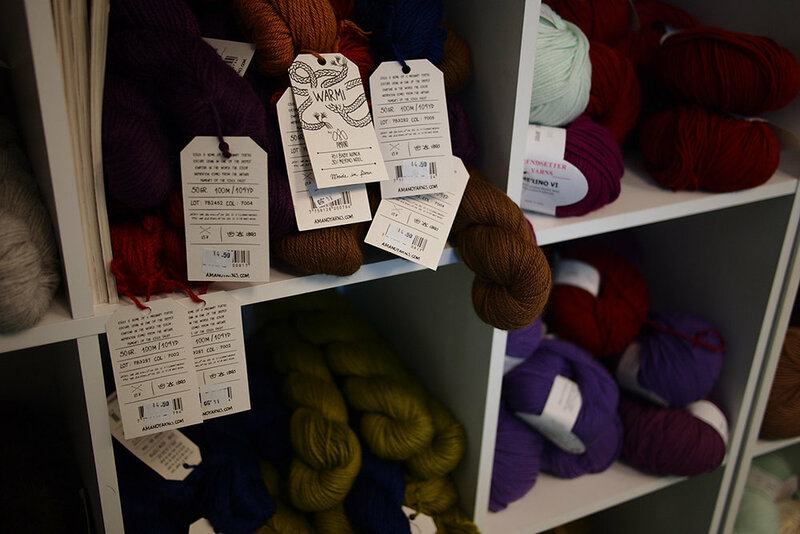 do you have any ways to curb your yarn buying? anything that's worked? anything that's absolutely failed? is it a worry at all for you, or is a big yarn stash to be welcomed? i'd love to hear how other knitters do it! my new camera arrived right after a knitpicks order! couldn't help trying it out with some stash pics. being only slightly familiar with shooting manual, this camera's been a challenge to work with so far, but i'm sure shooting comfortably will come soon enough. anyway--4 little skeins of comfy sport in sweet potato! my plan for these is to make my first pair of socks using silver's tutorial. i'm sure it'll help me along with picking projects to use this lovely stuff up. i want to argue that the attractive presentation of these wound balls have made it easier to put lovely color combinations as well, i see a lot more opportunity in my yarn stash than before. if you want to organize your stash, free up some room, or even count up how many yards you have left of something to better know how to use a skein, i highly recommend this little thing for you, it's done me very well so far ! in other news, i've been stashbusting with some fun little hairclip projects that have been on my mind for a while. there's something therapeutical about the making of these bows, not sure how i can explain it, but what i know for sure is that there will be more on the way. i really like how the ones so far have turned out, and hopefully someone will too. these sets of three are currently for sale on my etsy--have a look ! 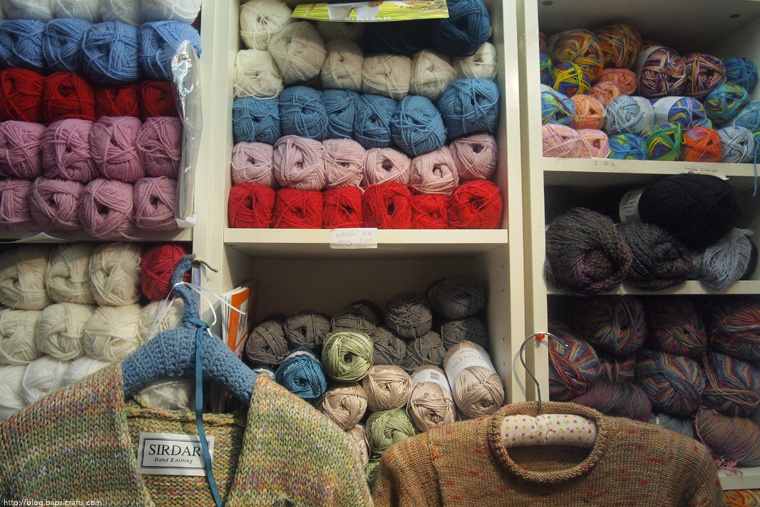 here's a photo of the old stash I got at 13 when my best friend taught me how to purl. 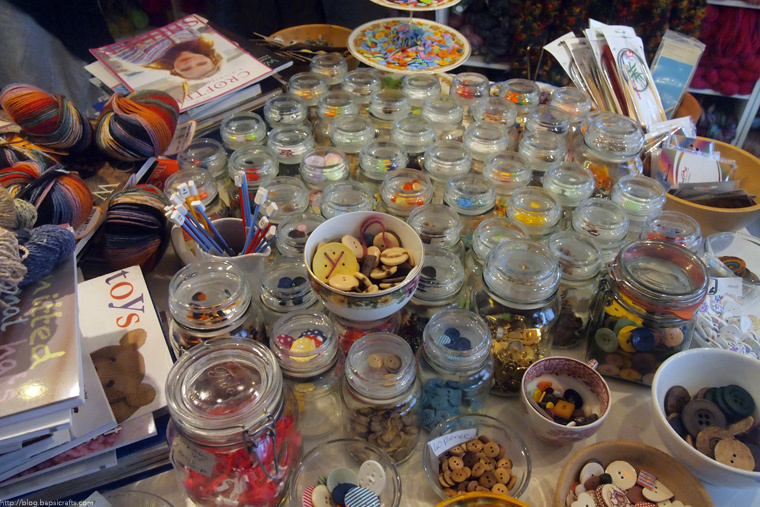 some were purchased, many were gifted, All of them Red Heart acrylics.